While we were busy with other things, a proposal was made to expand the Adams Avenue Business Improvement District (BID) into Kensington. The City website provides some information regarding BIDs. BIDs are formed to benefit the businesses in the BID area. Typically, a BID is initiated by local business owners petitioning the City to establish a BID on their behalf. Only 20% of the affected business owners have to sign the petition for the process to begin. Once the City Council has approved a resolution of intention, a copy of the BID proposal and resolution is sent to all affected businesses. After the City Council conducts two public hearings it may approve the BID establishment by ordinance, provided written protests are not received from business owners who will represent 50 percent or more of the total assessments to be collected. The formula for determining the assessment amount is determined by the business organization that initiates the BID process, not the City. The respective business group takes into account the type, size, and location of the businesses. Assessments are levied on businesses on the basis of relative benefit from the improvements and activities to be funded. In San Diego, the fees generally range from $40 to $500 per business each year. A few of the newer BIDs have higher fees, ranging from $90 to $1,200 per year, with some anchor businesses paying up to $5,000 to support BID-related projects. The fees help to fund BID board-approved business-related activities and improvements which will benefit the businesses. Activities, programs and improvements range from farmers' markets to business promotions to installing street lighting and removing graffiti. The City collects the fee on an annual basis. The BID assessment is included as a separate charge on the business tax certificate bill that every business receives. A BID can initiate a request to the City for the formation of a parking district with metered parking and/or the installation of parking meters in the BID area. The revenue generated by parking meters is split between the City General Fund and the BID, with 45% being retained by the BID. 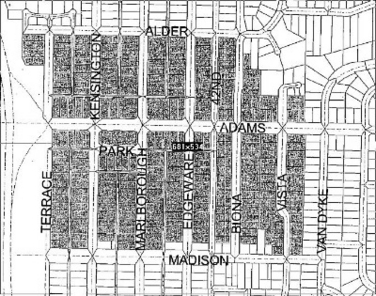 The Adams Avenue BID is managed by the Adams Avenue Business Association. Parking is already a problem in Kensington. Should the Adams Avenue Business Association, which is heavily dominated by businesses in Normal Heights, decide that a good way to raise revenues for their BID activities is by implementing parking meters in Kensington, as they already exist in the core Normal Heights commercial district today, it is the Kensington residents in the surrounding streets that will pay the price. Patrons of shops on Adams Avenue may choose to park further down the side streets to avoid paying the meters. One possible follow on to the introduction of a BID is a corresponding introduction of a Maintenance Assessment District (MAD) where previously there was none. What is a MAD? The City website has lots of info on laws concerning the formation of a MAD. There are two types of MADs - Park&Recreation-managed MADs and BID-managed MADs. Talmadge has a Park&Rec-managed MAD; Normal Heights and some part of the Kensington commercial district has a BID-managed MAD. MADs pay for, among other things, the upkeep of street trees and landscaping in the parkways. A BID may choose to implement a landscape theme within its boundaries, deciding, for example, to replace all of the parkway trees and flowers that exist now with Palm trees and pea gravel. Then a MAD becomes necessary to pay for the upkeep. 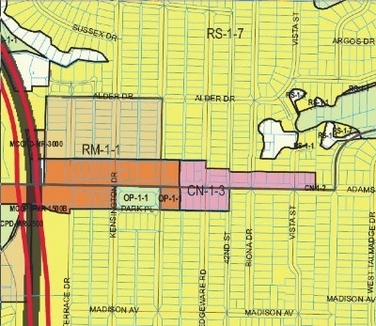 That is when the homeowners in the BID area will be assessed - when the MAD boundaries are stretched to match the BID boundaries.